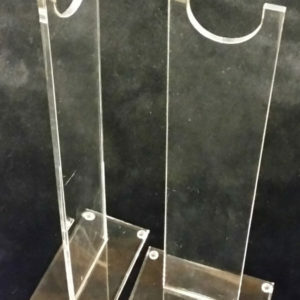 Pair of display stands height 32.5 cm (12 3/4”) base size 12 x 6.5 cm (4 5/8″ x 2 5/8″) The stands are made from clear acrylic which gives that floating in mid air effect so as not to detract from the weapon you are displaying. This is ideal for most Machine guns where more height is needed for the long magazine, A multi purpose way to show off your weapons and perfect for dealer show displays. 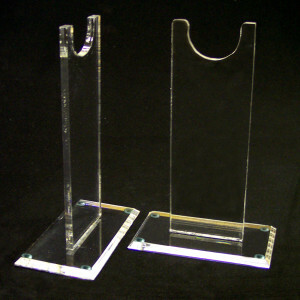 A pair of display stands height 12 cm (4 3/4”) base size 12 x 6.5 cm (4 5/8″ x 2 5/8″) This is our lower height stand made from clear acrylic which gives that floating in mid air effect so as not to detract from the weapon you are displaying. This is ideal for most rifles shot guns and muzzle loaders even telescopes and gun sights for collector display, A multi purpose way to show off your weapons and perfect for dealer show displays. 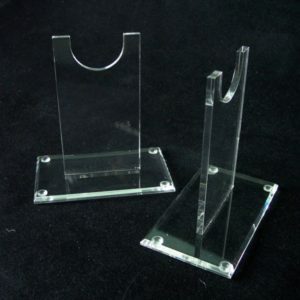 A pair of display stands height 18.5 cm (7 1/4”) base size 12 x 6.5 cm (4 5/8″ x 2 5/8″) The stands are made from clear acrylic which gives that floating in mid air effect so as not to detract from the weapon you are displaying. This is ideal for most rifles shot guns and mussel loaders for collector display, A multi purpose way to show off your weapons and perfect for dealer show displays.